﻿﻿ Nancy Gonzalez is my kind of designer. She keeps her craftsmanship impeccable and local. The materials from her bags all come from her own farms in Colombia, where the bags themselves are handcrafted. She uses the most exotic skins, but keeps her prices reasonable. 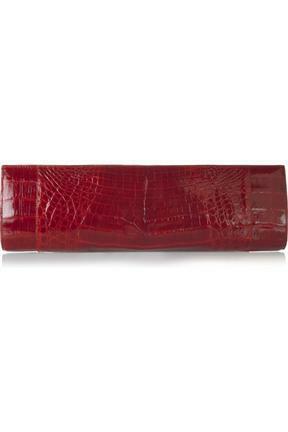 This long patent crocodile clutch is just another amazing bag in her collection. I know I've said it before, but patent crocodile has to be about the most ingenious thing I've ever heard of. It has this miraculous combination of multi-dimensional texture and super high gloss. Who could ask for anything more? Well, you could ask for it to be in a deep oxblood shade of red. Done. The elongated shape of this evening bag is simple and precise. It is designed, first and foremost, to frame the beautiful crocodile skin, a job it does beautifully. Even without the skin taken into consideration, the shape is elegant, refined, and totally timeless. No one is going to look back on this bag and say, "Oh, that's from 2010, when oversized clutches were popular." $1,200 for a crocodile skin bag is a bargain. No ifs, ands, or buts. This is an investment bag, but definitely one worth making. The Botkier Jaden Hobo, an everyday alternative to this bag.